Well boys and girls, I'm back. Between Jazz Fest and The Ponderosa Stomp (not to mention assorted bars and dives) I saw some absolutely incredible performances down in New Orleans. 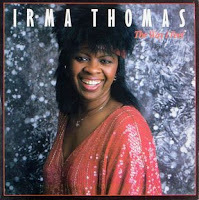 None of them, however, could touch those given by the mighty 'Soul Queen', Irma Thomas. Irma was born in Ponchatoula, Louisiana but was living in the big town with her family by the time she was in fourth grade. She was singing in the choir at the Home Mission Baptist Church, and won first prize in a local talent show before she was out of grade school. She began taking voice lessons, and actually recorded her school song with Chick Carbo by the time she was 13. Within a year, however, she was pregnant, and everything changed. By the time she turned 18, Irma was the mother of three, and a veteran of two failed marriages. Working nights as a waitress at the Pimlico Club to try and make ends meet, she became friends with the leader of the house band, one Tommy Ridgley. Tommy asked her to get up and sing one night, and Irma just tore the house down. After the owner of the club fired her, Ridgley hired her as his featured vocalist. He brought her down to meet Joe Ruffino, the owner of the Ric and Ron labels, and he signed her up. 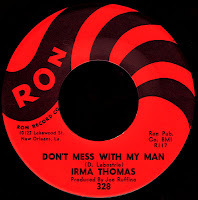 Her first record for the company, the very cool Don't Mess With My Man, was a huge local hit, and would climb as high as #22 R&B nationally in May of 1960. Written by Dorothy LaBostrie (who had provided the lyrics for Little Richard's 'Tutti Frutti' a few years before) and arranged by Ruffino's crack A&R team of Eddie Bo and Mac Rebennack, it just cooks. One more single for Ron would follow, A Good Man (which was written by Bo as well), but it didn't do much. Joe Banashak, meanwhile, was kicking himself because he had passed on the young Ms. Thomas at his fabled Minit auditions that January. He somehow convinced Ruffino to let her go, and brought her in to work with his resident genius, Allen Toussaint. Great records like Cry On and I Done Got Over It would follow, before Allen wrote what would become her signature tune, It's Raining. Although all of these singles were getting local airplay in New Orleans, they weren't doing much outside of the city limits (as legend has it, Otis Redding heard Irma's recording of Toussaint's Ruler Of My Heart on the radio while he was down there and took it back to Memphis. 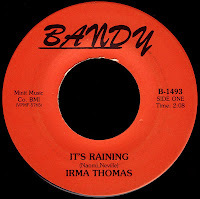 After changing 'Ruler' to 'Pain', his version would spend some 11 weeks on the R&B charts, while Thomas' died on the vine...) When Banashak sold Minit to Imperial in early 1963, he apparently kept the rights to Irma's output, and re-issued it in various forms on his Bandy label for years to come. Those were heady days in the record business, as the independent 'record men' were all looking for their chance to 'cash in'. Such was the case with Lew Chudd, who would sell Imperial (along with the newly acquired Minit label) to the west coast based Liberty Records later that year. 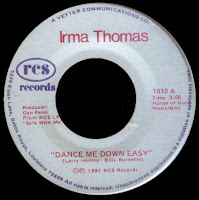 Better promotion and distribution led to Irma's biggest chart success ever, when a song she wrote herself went to #17 R&B in the spring of 1964. Wish Someone Would Care still holds up as one of her most loved works, and was originally arranged and produced as a demo by old friend Sax Kari. The follow-up record, Anyone Who Knows What Love Is would climb as high as #52 R&B that summer, but it's the B side of that single that gets all the attention today; a little number called Time Is On My Side, which was originally written by Jerry Ragovoy for Kai Winding in 1963. Arranger H.B. Barnum had pulled out all the stops - hiring New York songwriter Jimmy Norman to flesh out the lyrics and Allen Toussaint to oversee the production, he would create a masterpiece. The rest, as they say, is history, as The Rolling Stones would make it their first top ten hit in October, 1964. 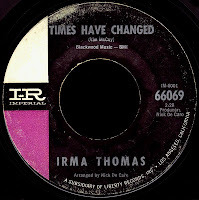 Irma's next single, Times Have Changed, barely cracked the top 100, and the title seemed to say it all. Imperial seemed unsure of what to do with her at this point and, after actually hiring James Brown to produce her (a move which Irma says resulted in her 'worst record ever'), they declined to renew her contract in 1966. She was signed by Leonard Chess in 1967, and sent down to Muscle Shoals to record at Fame. Chess had been getting great results down there with Etta James and Laura Lee, and thought that Irma would be a perfect fit. She was, producing three great singles for the label. 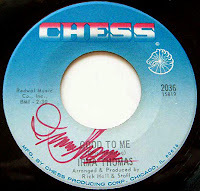 According to Thomas, Chess also wanted to manage her, and take 25% off the top of her earnings. She had been a 'road warrior' for years at that point, carrying her own band to chitlin' circuit clubs all over the south, and wasn't about to agree to those terms. Chess apparently lost interest after that and her cover of Otis Redding's Good To Me would be her last recording for the company. Despite a lack of promotion, it would reach #42 R&B in early 1968, which would turn out to be her last chart appearance. At this point, Irma decided to concentrate on family, moved out to the west coast and got a 'day job'. Although still performing in local clubs, not much else was on the horizon. 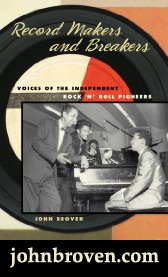 Wally Roker had come up as a member of Shep & the Limeliters, and worked A&R for Wand/Scepter in New York for years. 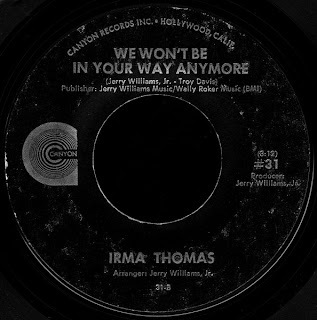 After moving to Los Angeles himself, Roker set up his own Canyon label and Irma Thomas would become his first 'big' artist signing in 1969. Her first single, That's How I Feel About You, was written and produced by Maurice Dollison, and didn't do much. At this point, Roker hired the legendary Swamp Dogg (aka Jerry Williams, Jr.) as his right hand man. Williams had been under contract to Atlantic both as an artist and producer, and felt his talents were being wasted at the big company. In addition to his monumental work with Doris Duke at Canyon, today's cool selection shows just how great Swamp was during this period. Written (with Troy Davis), produced, and arranged by Williams, this awesome B side managed to recapture all of Irma's fire, and was right on the money for the dawn of the 1970s. I'm loving that lead guitar! Due to the lack of any real national distribution, neither this side nor the flip (another great Swamp tune, I'd Do It All Over You) made the charts, and it wasn't long before Canyon ran out of steam. Irma would have one more release for Roker (on a subsidiary label he named after himself), before the company went bankrupt in 1971. 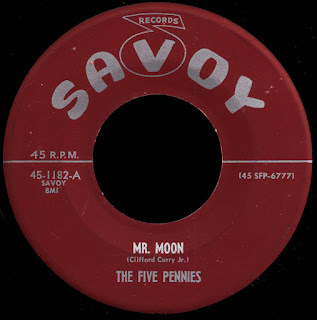 She would sign with Atlantic later that year, and they sent her down to Malaco to record with the great Wardell Quezergue, whose syncopated funky sounds were ruling the airwaves at the time (think Groove Me and Mr. Big Stuff). 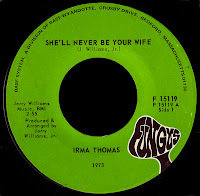 Perhaps it was Jerry Wexler's exalted opinion of Full Time Woman (he has said that it was his all-time favorite Irma Thomas record) that relegated the cookin' She's Taken My Part to the B side of her lone Cotillion release, I don't know. In any event, neither side charted, and the 17 other tracks Atlantic cut on her that year remain unreleased to this day! (although Full Time Woman was included in the great Atlantic Unearthed: Soul Sisters last year). By 1973, Irma was back working with Swamp Dogg, who had formed his own label by then - the interestingly named Fungus. Three great singles would follow, along with the very collectable LP In Between Tears. The highlight of all of this was Irma's 12 minute monologue 'rap' Coming From Behind, in which she just lays it all out as the prologue to a retake on her old chestnut Wish Someone Would Care. Great stuff, man! After a failed reunion with Allen Toussaint at a latter day Sansu (the only release being a shoddy recording of her 1976 Jazz Fest appearance which she still considers a 'bootleg'), the remainder of the decade saw her recording for local Louisiana labels like Maison De Soul and RCS. Produced by folks like John Fred and Dan Penn, her RCS album Safe With Me collected the best of those singles in 1979. The great Kent CD A Woman's Viewpoint - the Essential 1970s Recordings gathers most of her output from those stormy years (except, of course, the Cotillion sides) into one place, and is a must have. As the eighties dawned, Irma had settled down to a comfortable living with her husband Emile Jackson, singing commercial jingles for radio and TV, and playing gigs in local Crescent City clubs. 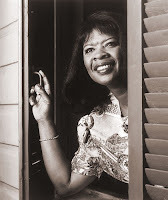 As Rounder Records became interested in all things New Orleans, she would sign with them in 1986 and began her twenty year affiliation with producer Scott Billington. Great albums like The New Rules and The Way I Feel still hold up today as some of her best work. She and Emile would open up their own club, The Lion's Den, and tour extensively in support of the albums with her crack band, The Professionals. In addition to seeing them at Jazz Fest every year, I would catch them whenever they came through New York. I'm a huge fan. 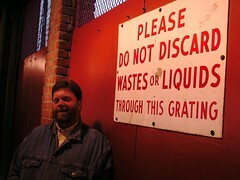 Like everybody else, I watched in horror as the levees gave way in August of 2005. Irma was on tour in Austin when Katrina hit, and although she lost everything in both her home and club, she vowed to rebuild. I remember watching her on the pay-per-view benefit thing from Madison Square Garden, and thinking that she looked heartbroken. 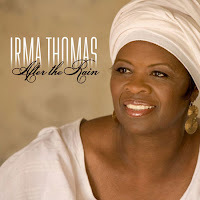 Relocating temporarily to Gonzales, Louisiana she recorded her latest Rounder release, the aptly titled After The Rain, and released it in time for Jazz Fest last year. This great record would win her a long overdue Grammy, and finally earn her the international respect she so richly deserves. Her vibrant performance on the big stage at Jazz Fest this year seemed to exude a whole new level of confidence, as if she had truly 'stepped into the role' of Soul Queen once and for all. As good as that was though, it was her tribute to Mahalia Jackson in the Gospel Tent that just knocked me out. Good God, this lady can sing! Her soaring rendition of Precious Lord gave me chills, man, and is a moment I will not soon forget. Just a word here on the state of things in New Orleans. While it did my heart good to see all the restaurants (like two of my all-time faves Mandina's and The Camellia Grill) back in action, and all of the music going on in the clubs and everything, a trip into the poorer neighborhoods revealed little improvement from last year. 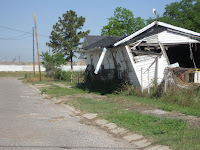 Nobody seems sure about what's going to happen here, as the fight continues on to save places like the Lower Ninth Ward from the bulldozer. The Insurance Companies, meanwhile, are refusing coverage to those who want to rebuild (or charging exorbitant rates nobody can afford to pay, which amounts to the same thing), and driving people away. I'm not one of these 'doom & gloom' guys, and as more and more folks return home everyday there's a lot of good news, but there's still some serious problems to overcome. 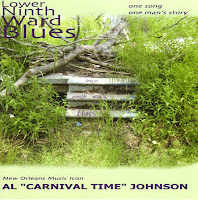 A case in point is that of Crescent City good time ambassador Al 'Carnival Time' Johnson. Al lost his house, and everything in it (including his Hammond organ), in the Lower Ninth. As his name implies, Al's the man that gave us the eternal Mardi Gras classic Carnival Time in 1960. He's put together an enhanced CD that includes his new composition Lower Ninth Ward Blues, as well as some stark photos of just how hard he got hit by Katrina. The package is being sold as a fundraiser by Patty Lee Records at the Louisiana Music Factory. Please consider buying one and helping Al out. Wow! At last I find a blog dedicated to the music I love, only to find out that there's actually four (!) blogs. I'll start with this article on Quenn Irma and continue - probably until tomorrow morning, when I have to go to work. Hi. 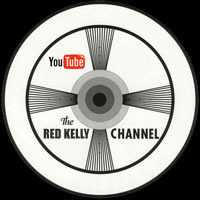 Just found your blog via a link from Funky 16 Corners andlike what I see. I was knocked out by Irma's tribute to Mahalia Jackson as well - I know they were filming it, but never found out what for, or if the music will be released. Any ideas? a very good question, indeed, Mark... they continued filming the rest of the program in the Gospel Tent that day as well. Thanks. Great post as usual, and I learned a lot. We loved hearing Irma here in Boston last month (for the second year in a row). I agree, what a great performer and person she is. And her title "Soul Queen of New Orleans" is not just self-promotion -- the title was conferred by the city. Long live the Queen! just meeting this voice of Irma Thomas. watched that show twice a day, Irma's songs more than that. opens her mouth and out comes this emotion-filled wonderful voice..no effort - it just happens and I'm lost. I didn't know about the "Blues". 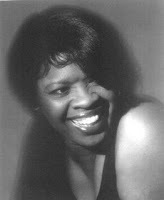 Irma Thomas means little in the U K but some of her songs have hit with cover versions years after they were made. Thus Breakaway-a cover she made of a Jackie de Shannon song-was covered at the time by Beryl Marsden on Decca and in the 80s hit for Tracey Ullman. Its raining was never issued in the U K but was a hit twice in the 80s for both the Darts and Shakin' Stevens.